Terminology from Agile Tortoise is an attractive dictionary app, available in a $2 iPad edition as well as a $1 iPhone version, which goes by the name of Terminology Ph. Regardless of the version, Terminology is a good-looking app—replete with smart font choices, a pleasant minimalist look, and an eye-friendly color palette. If you want a dictionary on your iOS device, Terminology’s the one to pick. As you tap out words along Terminology’s left column, a list of words that match what you’ve typed updates live. Well, sort of—I found that the filtered list consistently and noticeably lagged, which was annoying, but not a show-stopper. When you see the word you’re after, you simply tap it, and the definition appears. Word Wizardry: Tap out a word in Terminology, and a list of matches appears as you type; tapping the word you want brings up the definition. 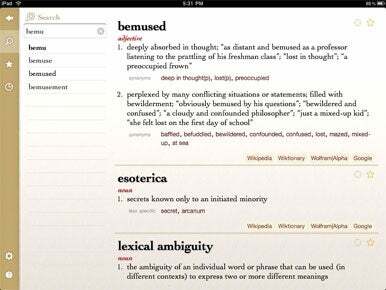 Those definitions are presented in a clean, clear layout that’s highly reminiscent of the printed dictionaries these iPad and iPhone apps emulate. On the iPad, things are, unsurprisingly, a bit roomier and better laid-out, but the iPhone version manages to avoid feeling cramped and does the best it can with the limited screen real estate. Beyond the definition and part of speech, Terminology also lists related words when available—synonyms, antonyms, and what the app calls “more specific” and “less specific” words. (When I looked up “joke,” less specific nouns included “humor” and “witticism”; more specific nouns included “belly laugh,” “dirty joke,” and “sight gag.”) Tap on any of those words, and Terminology instantly displays that entry. The words you look up form your Terminology history. You can scroll down through the list to revisit words you researched earlier. If you want to get back to certain words later, you can star them. The app conveniently lets you remove entries from your history too, so that no one has to know you looked up any naughty words. At a Loss for Words: In addition to a definition, Terminology also presents synonyms, antonyms, less specific words, and more specific words. Still haven’t found what you’re looking for? Tap a link to look up the word using other search tools. Actually, speaking of naughty words, the app includes a single setting: “Filter bad words.” Honestly, though, I’m not sure what the [filtered bad word] that checkbox does. Purely for the sake of research, I looked up numerous inappropriate terms, and regardless of my setting, the app happily delivered the filth I sought. That’s not an issue for me—I like my dictionaries ribald whenever possible—but if you prefer your dictionaries fully sanitized for your protection, be careful. If the definition you find isn’t enough, or if Terminology lacks the word you’re looking for all together, fret not. 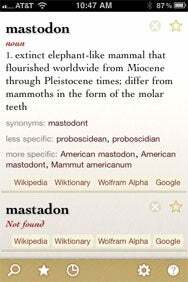 The app conveniently offers links to look up the word in question on Wikipedia, Wiktionary, Wolfram|Alpha, and Google, through an in-app browser. I found I needed to use the Google link on occasion, since Terminology currently doesn’t do any fuzzy spelling matching. When I mistyped “myriad” as “myraid,” Terminology offered me nothing, but Google instantly figured out the word I was after. My biggest knock against the app, though, is that my need for a devoted dictionary is becoming ever-more minimal. All the best e-reading apps offer built-in definitions, and if I stumble across an unknown word somewhere else, I’m just as likely to Google it. Still, if you prefer a devoted dictionary, Terminology is an exquisitely-crafted one, and a pleasure to use.